Keep in mind: This presentation is targeted at cardiologists who know the complication rate of catheter ablation is low, about 1%-3%. As patients, to evaluate this rate you need a point of reference. For example, the complication rate of the common Appendectomy is about 18%. Catheter ablation is a low-risk procedure comparable to a routine Tubal Ligation (1%–2% risk rate), though it’s not risk-free. While Dr. Keane’s presentation covers an extensive list of possible complications, most catheter ablation complications are, in fact, minor—such as bleeding and bruising at the groin. Most are resolved in two to three weeks. 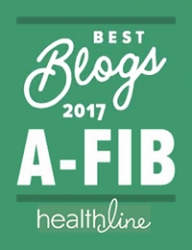 The most important information for A-Fib patients presented at this year’s Symposium was the observation that: The biggest predictor of in-hospital complications for Medicare patients was A-Fib ablation volume of less than 25 per year. 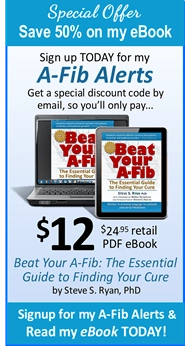 [This astounding statistic is a wake-up call for all A-Fib patients. The vast majority of A-Fib ablations are performed by operators who are probably the least proficient and certainly have the highest complication rates. As A-Fib patients, we have to make every effort to be treated by high volume centers and operators. In general, high volume doctors wouldn’t be performing so many A-Fib ablations if they weren’t good and highly successful, with lower complication rates. The biggest predictor of in-hospital complications…was volume of less than 25 A-Fib ablation per year. Complications from A-Fib ablation should be viewed in perspective. How does the success and complication rates of catheter ablation stack up against a lifetime on antiarrhythmic drugs (AADs)? Radiofrequency Ablation (RFA) had a higher efficiency rate and a lower rate of complications than AAD Therapy. From 1990-2007, the single procedure success rate for Radiofrequency Ablation (RFA) without need of post-op AAD therapy was 57% (today’s success rates are in the 70%-85% range),3,4,5 multiple procedure success rates without post-op AADs were 71% (today’s success rates are closer to 90%), and the multiple procedure success rate with post-op AADs was 77%. The success rate for AAD therapy alone was 52%. The meta-analysis included five AADs: amiodarone, dofetilide, sotalol, flecainide, and propafenone. Amiodarone was the most effective. The overall death rate for AAD therapy was 2.8% (Sudden death was 0.6%, treatment-related death was 0.5%, non treatment-related death was 1.3%). There were no procedure-related deaths in the Radiofrequency Ablation (RFA) studies, though the overall death rate was 0.7% (in-hospital deaths). [Most adverse events associated with antiarrhythmic drugs (AADs) are life altering and permanent. For example, bradycardia requires a pacemaker. Whereas the worst complications from catheter ablation are generally short term and not permanent. For example, when tamponade is repaired, the heart usually returns to normal. In general, it appears it’s safer to have an ablation than to not have one and live a life-time on AADs. Because of adverse events, 10.4% of patients discontinued antiarrhythmic drugs (AADs), 13.5% discontinued AADs because of treatment failure, 4.2% just didn’t take the ADDs. The overall discontinuation rate of AADs was almost 30%. Blood or fluid that collects in the pericardium, the sac around the heart, is called a Tamponade. This pressure can prevent the heart from beating and feels like one is being strangled. Doctors need to drain this fluid or blood from the pericardium. This is probably the most dangerous complication from a catheter ablation. If an EP or the hospital staff aren’t careful, this could lead to serious complications, even death. Serious tamponade is more often produced by inexperienced EPs who are more apt to apply too much pressure when making ablation burns, and are also more likely to miss the tell tale signs of a tamponade in its early stages where it’s fairly straight forward and relatively easy to repair with little or not danger or long term effects. When a tamponade is fixed, there are usually no lasting problems. Dr. Keane explained how doctors can detect a tamponade by using echocardiography. The most dreaded complication possible with catheter ablation is Atrio-Esophageal Fistula, but happily it’s also the most rare. When a catheter makes an RF burn in the back of the heart near the esophagus, the heat from the catheter may damage the esophagus wall which can later be eroded by gastric acids allowing blood from the heart to leak into the esophagus. This is a very rare complication (less than one in over 1000 cases) that can be fatal. It usually takes a period of 2-3 weeks for a fistula to develop. During this time gastric acids eat through the esophageal area weakened by heat from the RF catheter. It’s the most difficult complication to recognize early and may not be detected during procedural hospitalization. Most doctors and centers take great precautions to prevent Atrio-Esophageal Fistula, for example, by putting a temperature probe down the esophagus to measure heat and stopping the ablation if heat rises. Doctors also prescribe proton pump inhibitors to be taken for 2-3 weeks after an ablation in order to prevent gastric acids from eroding the esophagus. 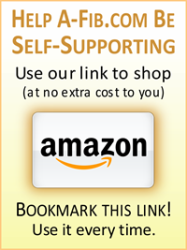 [Patients can do this on their own by using over-the-counter proton pump inhibitors like Nexium or Prilosec.] Added 9/11/17: Cecelia writes that taking the Proton Pump Inhibitor omeprozole (Prilosec) caused her muscle weakness, weak legs and arms (and anxiety). She took it for six weeks during her blanking period after her ablation to protect the esophagus. Pantoprozole (Protonix) seemed to have the same effect on her. Muscle weakness is listed as a possible side effect of reflux meds. If you have developed an A-Fib-related clot prior to your ablation (usually in the Left Atrial Appendage), a catheter ablation may dislodge it and cause a stroke. To prevent this, some centers check for clots by using a Transesophageal Echocardiogram (TEE) or CT before the ablation. If they find one, you take blood thinners to dissolve it before having your catheter ablation. Pulmonary Vein Stenosis is a swelling, constriction or narrowing of the pulmonary vein opening into the left atrium. This swelling can restrict blood flow from the lungs into the heart. This was an all-too-common problem in the early days of catheter ablation when RF burns were actually made inside the PVs causing swelling and stenosis. A rare but potentially significant complication is Stiff Left Atrial Syndrome (also seen after surgical approaches using multiple lesion burns in the left atrium). The ability of the left atrium to contract is compromised which also causes pulmonary hypertension, shortness of breath, and congestive heart failure. Unlike most catheter ablation complications, this is most often a permanent and debilitating complication. Of the study participants who developed Stiff Left Atrial Syndrome (1.4%), most had a lot of scarring to begin with. Then they probably received more ablation lines and burns than in a normal PVI. These additional burns and scarring could be responsible for weakening their ‘atrial kick’ (strength of the atrial contraction) and producing Stiff Left Atrial Syndrome. There are unforeseen complications—things that can happen any time you go into a hospital. Dr. Keane showed that catheter-related complications from 2002 to 2010 have significantly decreased as A-Fib ablation techniques and experience have improved, while the number of ablations has more than tripled. In a study of Medicare data on catheter ablations from 2001-2006, there were 25 “in-hospital deaths” out of 6,065 cases (0.41%). This is a very high and disturbing death rate compared to most other studies. But this finding should be interpreted with caution. Medicare data doesn’t list causes of death or whether a death was procedure related, though one would think that most of the deaths would be directly or indirectly associated with the ablation procedure, as compared to other hospital causes of death like sepsis. [Medicare also does not currently have a specific billing code for A-Fib ablation—a strange oversight considering how many people have A-Fib.] However, the study did conclude that in-hospital death was significantly associated with hospitals who performed a lower volume of catheter ablations. Dr. Keane cited another large study of 15,423 Medicare patients with A-Fib who had a PVI and were followed for a year (July 2007 through December 2009). Of the total, 1,912 of these patients were over 80 years old. All-cause mortality was significantly higher (almost 10%) in the over 80 group. Stroke rate was also higher.15 Most Ablations done by low-volume operators produced the most complications. The biggest independent predictor of in-hospital complications was operator volume of less than 25 ablations per year. In a study of 93,801 A-Fib ablations performed from 2000 to 2010, “more than 81% of…A-Fib ablation procedures were performed by operators with an annual A-Fib volume of less than 25.”16 In this study the overall frequency of complications was 6.29% (but this includes minor complications like bleeding at the insertion sites). Women had higher complication rates than men (7.51% vs 5.49%). “In-hospital deaths” was 0.42% as in the previously mentioned Medicare study. The over-80 age group had more complications. The biggest independent predictor of in-hospital complications was annual operator volume of less than 25 catheter ablations per year. In this study the complication rate remained steady in low volume operators over the years. 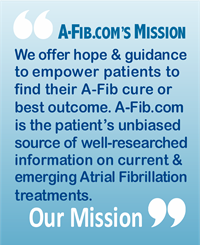 We’re also indebted to Dr. Keane for identifying a rare but potentially debilitating complication not even mentioned in other studies of A-Fib procedure complications—Stiff Left Atrial Syndrome. Though one tends to see this in the more extensive surgical operations for A-Fib, it can happen in RF ablation as well where many ablation lines have to be made. Patients with non-paroxysmal A-Fib who may already have a lot of scarring and fibrosis in their hearts due to long-time A-Fib, need to be warned that there is a real (1.4%) risk of weakening or even losing the function of their left atrium. “In-hospital deaths” is a statistic that needs to be much more closely examined. The various studies often indicate that the deaths were not ‘procedure’ related. Then what was the cause of the deaths? 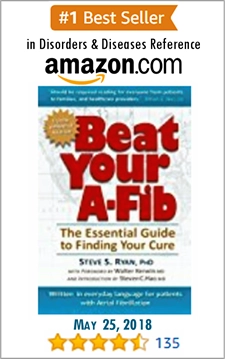 People who have A-Fib also often have accompanying health problems. Unfortunately Medicare data doesn’t list cause of death. We’re also indebted to Dr. Keane’s research for reviewing the non-randomized data to suggest that a life on antiarrhythmic meds (AADs) may be more risky and cause more complications that a catheter ablation (PVI), and we eagerly await the results of the ongoing CABANA trial in this regard. The success rate for AADs is low (52%) compared to a PVI. AADs also cause more adverse events than catheter ablation (30% vs 5%), and these adverse events are often more serious and permanent. AADs often don’t work or have intolerable side effects. If they do work, they often lose their effectiveness over time. 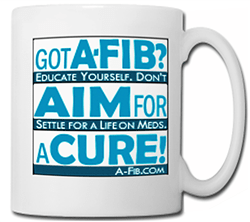 We don’t yet have a magic pill that will cure A-Fib. Because of the above problems with AADs, according to current guidelines you don’t have to first try various antiarrhythmic meds for a year or more before proceeding to a catheter ablation (though most doctors will still recommend you do so). By spending a year or more trying various AADs, you risk remodeling your heart, developing fibrosis which is irreversible, etc. Plus your quality of life deteriorates thanks to still being in A-Fib and/or dealing with the bad side effects of the AADs.